Biolight, solar and rechargeable light are a logical move for people who love the great outdoors, and who want to keep it that way. Rechargeable light is the future and we’ve chosen some of the best solar and most eco-friendly rechargeable lanterns, which strike a balance between great value and great performance. Keep your solar light out during the day to charge, and enjoy free energy all night long. If you’re hiking, find a way to secure your lamp to your rucksack, and charge as you walk. As always at Camping Things, we only review the best, most value-for-money options, so you’re assured a great deal, whichever light you pick. Even though this Solar Camping Light is mostly plastic, there’s something reassuringly sturdy about it. It’s really well designed, and it looks great. In testing, it stands up to general use well, and would make a great addition to any seasoned or weekend camper’s kit. Made mostly from quality plastic, there’s a solar panel on top which is protected by a fold-over cover. The AGPtek doubles as a charger, and comes with a built-in USB port, for plugging in phones, tablets and other devices. We were seriously impressed this versatile light, much brighter than other camping lights with a lower energy consumption. Works as either a standing lamp, or a hanging lantern. Looking like something out of a dystopian movie, the Sidiou is certainly futuristic, stacking 30 LEDs in total to produce a solid block of light that charges during the day using the built-in solar panel. You can charge your phone and other devices using the Sidiou, as well, as it comes with a USB port and charger cable. A bit of an unconventional shape, and the Sidiou doesn’t hang like many of the others, but if you’re not concerned about that, then it’s a great light. The Sidiou isn’t as pretty as some of the other lights here, but the build quality is decent. It’s made from durable plastic, and is designed to be flipped to the solar panel side during the day, and to stand on end or flat to light at night. One of the best Rechargeable light units we tested. The solar panel covers most of the back part of the Sidiou, so it charges fairly quickly. Once fully charged, the light has a maximum on time of around 6 hours, so plenty if you’re just using it for the evening, and intend to charge it again the following day. 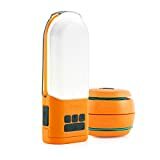 The SUBOOS Ultimate Rechargeable LED Lantern is a rechargeable LED lantern that’s perfect for rough and tumble weekend camping trips. Its compact design sand the hanging handle is sturdy enough to inspire confidence when hanging inside or outside in strong winds. We like the minimalist, sort of retro design, and are certain that the SUBOOS Ultimate Rechargeable LED Lantern is a solid performer. Built with the sort of quality you would expect to last many years, the SUBOOS Ultimate Rechargeable LED Lantern and Power Bank is great for indoor and outdoor use. As a piece of camping kit, this LED Lantern loves getting wet, its pretty tough, so you can sling it in your kit and be off. A great contender for best rechargeable light. Turn your tent into a rave, SUBOOS Ultimate Rechargeable LED Lantern and Power Bank is super bright at 185 Lumens and dims by simply pushing the button on the side, it also has regular bright, red, and red strobe modes. Made with a plastic outer and clear plastic LED cover. The top section lifts up to activate and reveal the light elements you can charge your phone , GPS or tablet via the micro-USB recharge connection. It’s a great piece of kit, super bright, lightweight with a hanging hook and a dimmer switch on the side. The SUBOOS Ultimate Rechargeable LED Lantern and Power Bank is all about performance. We’re huge fans of BioLite, and their Nanogrid set makes a fantastic addition to your eco-friendly lighting kit (also a great gift.) Share your energy between devices, by linking them together, and charge phones and tablets by plugging them into the built-in USB ports on the BioLite set. The BioLite’s SiteLight system has a 20 ft cable reach, so it’s perfect for arranging and lighting a small campsite. BioLite are a New York-based startup who specialise in high-end portable, solar lights. They’re built to last, they look great, and they’re made from extremely high quality materials. We absolutely love BioLite, and cannot recommend them highly enough. The whole system stacks away neatly, and is made from a combination of hard-wearing plastics, with a fabric connecting cord for the SiteLight set-up. Included in the BioLite Nanogrid pack are two hanging lanterns and a handheld torch/standing light. The SiteLight cord connects all of the lights together, enabling you to share the energy between them. You can also charge your phone and other devices using the built-in USB ports on the BioLite Nanogrid. Comes with the option to hook up other BioLite products, such as the BioLite Basecamp lamp, and BioLite solar panels. When what you’re looking for is maximum run time, this solar powered lantern is a great option. Unfussy, fold-out design exposes the solar panels for charging during the day, and once fully juiced up, the light has an operating time of up to 40 hours, depending on the light intensity level selected. Small and mighty, this lantern is great quality and folds up neatly to protect the solar panels on the inside. It’s made from high quality plastic, with a frosted dome front to help diffuse the light and make it more ambient. This is a solid Rechargeable light. A great piece of kit included with the BioLite Nanogrid are two hanging lanterns and a handheld torch. You can also charge your phone and other devices using the built-in USB ports on the BioLite Nanogrid.